What is the best deflation investment strategy? We first need to define what deflation is and assess how likely it is to take place. Although it’s relatively easy to find the best deflation investment strategy, the hard decision would be when to deploy it. Governments and central banks around the world will do almost anything to avoid the de-levering that would cause deflation. Unfortunately I need to define what deflation is first of all. I say unfortunately because the financial community still believes the CPI measure can be relied upon. Under a CPI based definition, deflation is defined as a negative CPI number. We cannot rely on the CPI measure to define inflation or deflation. The CPI is a statistical construct that is open to manipulation and is skewed by changes in living standards. The basket of goods used to measure price changes within the CPI is not fixed but adjustable. Therefore, when living standards are falling, the quality of goods within the CPI basket is declining. In such an environment, the CPI measure UNDERCOUNTS the true rate of price inflation. See my article on the CPI for more details. We can infer the rate of price inflation from changes in price of goods of constant quality, such as commodities. My specific choice of commodity is gold because its supply is stable and it has been used as money and a store of value for centuries. To summarise, we can define deflation as a DECREASE IN THE PRICE OF GOLD in the home currency. 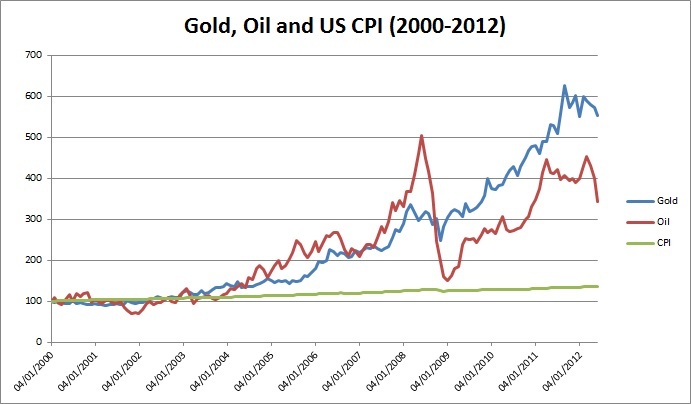 Although CPI has been relatively muted over the last 12 years, commodities prices have skyrocketed. This explodes the deflation myth. As the economy declined, the standard of quality within the CPI basket also declined. In this environment, the CPI indicator has a large downward bias relative to the true rate of price inflation, as revealed by the price of gold. Although we have not been in a period of deflation, we have witnessed periods where deflation has threatened to take hold. A classic case would be the second half of 2008, when the bankruptcy of Lehman Brothers threatened to bring the whole banking system down. The resulting collapse in money supply would have led to deflation. But the authorities stepped in to ensure this wouldn’t happen. Two scenarios would bring about deflation: a money supply falling at a greater rate than a declining economy, or a money supply that is rising at a slower rate than a growing economy. In either case the supply of money is declining relative to the supply of goods, but the investment strategy for the two is different. Thankfully, it is only the former case that we need concern ourselves with for the next couple of years as there is no chance of the economy growing! The best deflation investment strategy in this scenario is CASH. As the money supply falls relative to GDP, the purchasing power of cash INCREASES. We have seen that in some cases, the long-term bonds of governments can also do well. However, you need to be VERY selective about which sovereign to go for. Cash is king! You have to ask yourself though: how likely is it that government will allow their banking systems to collapse so that the first type of deflation takes hold? We have seen that even in the most extreme circumstances; governments have bailed-out their banking systems. Even in cases where this bankrupted the nation, such as Iceland, they have not hesitated. In such a scenario, you can be sat there in cash only for the supposed deflation to never take place. As we are not in a period of deflation, the time for you to implement a deflation investment strategy has not arrived. Governments are hell-bent on following bail-outs and money printing at even the first whiff of deflation. Governments have a long-track record of making sure non-growth induced deflation doesn’t happen, even when that means destroying their own currency. As a consequence, you are almost always better off AVOIDING a cash based deflation investment strategy. If deflation does threaten again; you can rest assured that some bail-out will be just around the corner and your cash will be GREATLY devalued.